The JID (Junta Interamericana de Defensa, or IADB Inter-American Defense Board) is "an international committee of nationally appointed defense officials, who develop collaborative approaches on common defense and security issues facing the Americas. The JID-IADB provides technical advice and services to the Organization of American States. Our current programs include humanitarian demining in Central America, reporting on confidence and security building measures, and developing educational programs on regional security". "The IADB was created in 1942 by foreign ministers of 21 states, in the middle of World War II. It is now the oldest existing defense organization in the world. In March 2006, the OAS assumed formal authority over the IADB. As of that date, 26 of the 34 members of OAS were also members of the IADB". The official languages of the JID-IADB are Spanish, French, English and Portuguese. The Inter-American Defense Board (IADB) is the oldest regional defense organization in the world, it was created on March 30th, 1942. Its main purpose is to provide the OAS and its member states with technical and educational advice and consultancy services on matters related to military and defense issues in the Hemisphere in order to contribute to the fulfillment of the OAS Charter. The IADB enjoys technical autonomy in carrying out the purpose and functions contained in these Statutes, taking into account the mandates of the OAS (General Assembly, Meeting of Consultation of Ministers of Foreign Affairs, and Permanent Council). Currently, the IADB has 27 Member States and its structure is composed by the Council of Delegates, by the Secretariat and by the Inter-American Defense College, bringing together civilian and military representatives of various American countries. Art. 45 of JID-IADB C-3088-S Regulations Manual refers to the Symbols of the JID-IADB. The flag was established on Assembly Session 606 of January 9, 1973. It has a plain white flag with coat of arms. 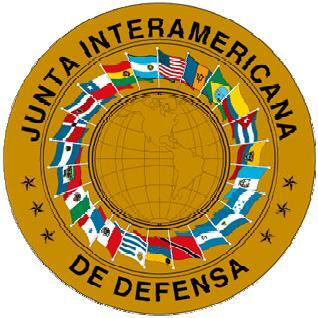 The flag of the Inter-American Defense Board (Junta Interamericana de Defensa) is white with the committee logo in the middle. "The Inter-American Defense Board is an international committee of nationally appointed defense officials who develop collaborative approaches on common defense and security issues facing countries in North, Central, and South America. The IADB provides technical advice and services to the Organization of American States (OAS)."